As parents, we’re all fully aware of the dread and horror that can come from meal times with a baby. Food on the floor, food on you, and food all over your baby are common occurrences that are an inevitable part of being a parent. If only there was some way to make things easier. Fortunately, there is. Thanks to the recent releases from baby-product companies, parents have access to a vast range of baby bibs designed to keep your baby happy and clean during mealtimes, giving you one less job to worry about. 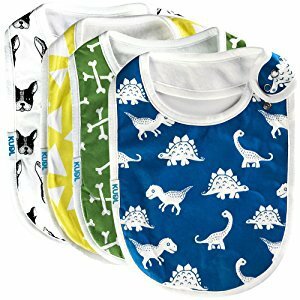 To give you the best and easiest shopping experience, I’ve selected some of my favorite baby bibs that are currently available. These are the best of the best, designed to give you peace of mind, and stop your baby from dropping food all over themselves. To start my list, I’ve chosen an incredibly simple to use baby bib that’s designed to alleviate any dinner time stress. With traditional baby bibs, they were originally made of cloth, meaning you had to wash them with the rest of your laundry, leaving them to stain. You can say goodbye to that age-old parental concern with these new silicone bibs. Made from highly protective and durable silicone, these bibs can be washed in the sink after use, ensuring they are quickly ready to use again. The silicone materials used in the production of this time-saving design is made from food-grade composites that are completely resistant to stains, and are highly waterproof, meaning it’s designed to last your baby for many years to come. The bib can be effortlessly attached to your baby using the adjustable locking buttons at the back, making the taking on and taking off time at meals effortless. What's Great About It: As you’ll notice, this bib prides itself on a large, deep silicone tray that is designed to catch any food or drinks that your baby happens to spill. Not only does this protect your baby from stains, but it also helps to protect your floors, work surfaces and the hook-on high chair. Next up, I’ve chosen a simple yet effective bib that’s specially designed for maximum versatility. Made from highly durable cotton fabrics, this is one comfortable baby bib that you and your child are going to love. Perfect for catching any food, drink, drool or little bits of sick your child expels, you can be sure that your baby is fully protected from unhygienic messes and stains. Despite being made from Terry cotton, these bibs are soft, highly absorbent and boast outstanding waterproof protection from all kinds of food and liquid, perfect for maintaining a long life and high level of cleanliness for your baby’s clothes. These bibs are easy to put on and take off thanks to the simple to use loop-and-hook system that will set your baby up for dinner in no time at all. What's Great About It: In addition to all these outstanding features, you can guarantee safety as these bibs contain no harmful chemicals such as PVC, formaldehyde or azo-based chemicals. Furthermore, these bibs are 100% machine washable, allowing you to keep them clean and ready to use with minimal effort. If you are looking for a long-lasting, highly durable and protective silicone bib that will ensure that dinner times a breeze, this bib may be for you. One of the most lightweight bibs in my collection, these are made from 100% food-grade silicone materials, ensuring your child is safe from potentially harmful chemicals. You won’t even have to put these bibs in the wash as you can simply put them in the sink with the rest of your washing up. What’s more, despite their rigid build, this bib rolls up incredibly easily and compactly, enabling you to take them with you wherever you go, whether it’s a friend house, a café or a restaurant, without any damage to the bib itself. This means you can keep a spare with you. What's Great About It: Enabling you to purchase a bib that matches your baby’s personality, there are seven unique, beautiful and visually-stunning graphic designs to choose from, allowing you to choose a bib that will make you smile every day. Sometimes, when investing in products for your child, you want a product that’s fully functional and looks great on your child. This is the exact niche that the Matimati Baby Bibs excel in, with no decrease in the outstanding level of quality. 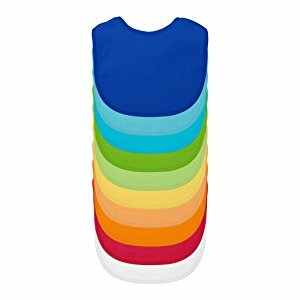 Made from 100% soft organic cotton, these multi-layered bibs contain a super-absorbent layer of polyester fleece materials, perfect for absorbing any drool, spit up, food, and drinks. These bibs are incredibly easy to put on and take off thanks to the harmless chemical locks, fully adjustable for use as your baby grows, ensuring you won’t have to pay for new bibs. This locking system also ensures that the bibs stay perfectly in place and can’t be pulled off by your baby, guaranteeing a successful dinner time every single day. What's Great About It: As a set of four, you, your baby and your family will be able to enjoy unique, vibrant and captivating designs that you’ll fall in love with, meaning your baby will look the part, any time of the day. Sick of having to change your baby’s clothes after every meal because they are covered in drool, food, drink and sick? 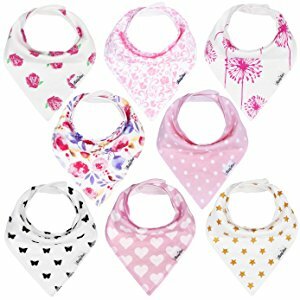 This problem will be a thing of the past thanks to the outstanding 8-piece bandana bib set from Kiddystar. These ultra-comfortable bibs are designed to be as lightweight and comfortable as possible, ensuring minimal stress for you and your baby during feeding times. What’s more, each bib comes with its own unique design, something that every member of the family can enjoy. Each bib is doubled-layered, creating a unique ‘Smart Moisture Management’ system, produced using cotton and fleece materials, ensuring that any substances that are spilled are instantly absorbed and held. This helps prevent the substances from staining your baby’s clothes. What's Great About It: All the materials used are tested and guaranteed to be 100% free of allergen materials, perfect for babies who suffer from allergies or respiratory problems, such as asthma, further protecting the well-being of your child. To conclude my selection of favorites, I’ve chosen this fantastic, affordable and highly functional set that every member of your family is going to love. These 4-pack sets come in five unique designs, enabling you to choose a set for your girl, boy, or a gender-neutral set, making them ideal for siblings too. These dual-layered bibs are made from a comfortable cotton layer as well as a highly absorbent fleece layer that guarantees to keep your baby’s clothes stain-free. Suitable for children aged three months and above, each bib in your set is completely machine-washable, allowing you to simply throw it in the wash with the rest of your clothes. This ensures they are always clean and ready for the next use, saving you time having to wash and re-wash your baby’s clothes. The back of the bib contains a handy and easy to use locking system, holding the bib in place while being adjustable enough to grow with your baby. What's Great About It: Thanks to the highly personalized and unique designs, you can find a design that will suit your baby's personality, which makes this bib set perfect for a gift for a birthday or a baby shower. Related Read: What is the Best Organic Baby Food? Now that you know what some of the best of the best baby bibs are, it’s time to choose the best bibs for your baby. 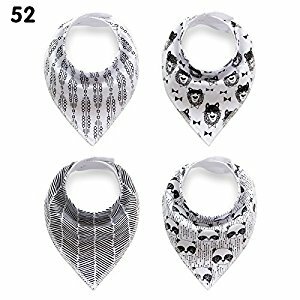 Using my step-by-step buying guide below, learn everything there is to know about baby bibs so you can make the best purchasing decision possible. As with any child-related product, you want quality in the products you buy. The best way to check the quality is by the materials that the bibs are made out of. In this instance, you’ll want highly durable cotton materials, as these have been proven to be the best. This provides a comfortable fit around your child while promoting a long lifespan for the product itself. Alternatively, silicone bibs are slightly more expensive, but will last for many years without deterioration. Another great way to check if the bib you’re buying is high-quality is by checking if the product has a guarantee. If you’re shopping in a local store, ask an employee of the shop. If shopping online, always check the product description as it will be listed here. You’ll probably be using the bibs for around two years, so any product with a 36 month guarantee is recommended as a minimum. More in Baby Feeding: What's the Best Formula for Gassy Babies? The main aspect of buying a bib is so it can absorb any of the food, drink and spit up that your baby presents you. If your bib doesn’t achieve this function well, it’s not doing its job properly. The best way a bib can absorb these substances is by providing you with multiple layers. One of the most absorbent materials used is polyester, which is usually found in the second layer of most bibs. When choosing the ideal baby bib for you, ensure the bib you have chosen has a high rate of absorption, capable of catching and holding all liquids and foods so it can be washed easily. Alternatively, a silicone bib can catch food as it runs down into the catch tray that can be easily emptied out into the bin and then washed up with the rest of your dishes. Putting your baby’s bib on and taking it off can be a nightmare, to say the least. If your baby doesn’t want the bib on, the chances are that they are going to put up as much of a fuss as possible. To eliminate this age-old problem, many of the more modern bibs will have quick to use and highly adjustable locking systems that will enable you to put the bib on in a matter of seconds, minimizing the chance that your baby will be able to react and cause a fuss. Read: Which is the Best Baby Food Maker? 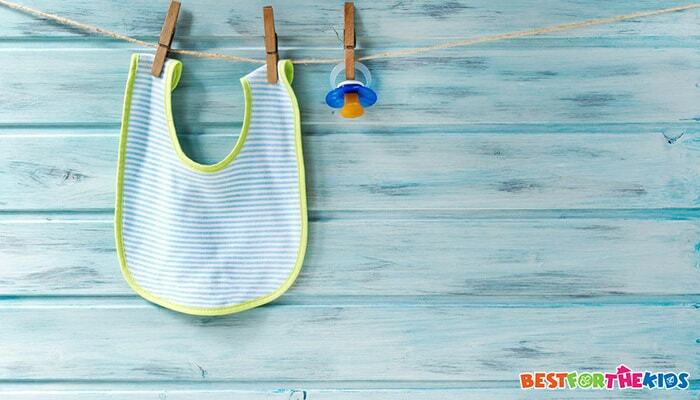 Washing your baby’s bib should be a breeze. When trying to buy the perfect bibs, consider what type of bib you have chosen. If you have chosen a fabric bib, it’s essential that this bib is machine washable. Otherwise, you’ll have to wash the bib by hand which can be extremely time-consuming. Alternatively, if you have chosen a silicone bib, you can easily wash this with the rest of your dishes, again saving you a ton of time. 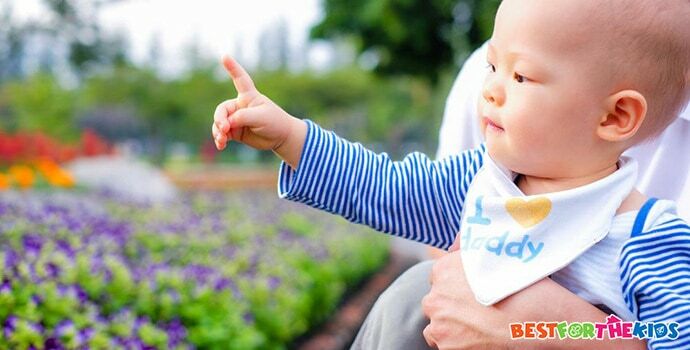 Investing in a baby bib can be extremely beneficial to both you and your baby. Not only will you reduce the amount of food and drink substances that come into contact with your baby’s skin, but you can also protect your baby’s clothes from stains, increasing their lifespan. By investing the right amount of time in choosing the ideal baby bib, you can ensure you’re making the perfect purchase that will save you a ton of hassle in the long-term.